Computational Modelling '19 is to be held at the National Maritime Museum Cornwall, an independent museum located on Discovery Quay in Falmouth. The National Maritime Museum Cornwall celebrates the incredible maritime history of Falmouth, Cornwall and how the sea influences global culture. We strongly recommend that you extend your stay, to explore Falmouth and its surrounding area, boasting some of the world's most stunning coastal scenery. The best way to see Falmouth and its coastline is on foot. At the end of the first day's session, there will be an optional guided coastal walk with magnificent vistas of Falmouth Bay and the local beaches. Meet outside the hotel at 16:30. The name of Falmouth is inextricably linked with maritime history. Located on the sheltered bank of one of the finest natural harbours in the world, and at the mouth of a network of creeks and rivers, Falmouth was the port from which the renowned Packet ships set sail to the Mediterranean and the Americas in the seventeenth century. The Fal Estuary's deep water and sheltered anchorage have been of strategic importance to the defence of Britain since Tudor times. Any enemy ship securing the waters could easily land an army on the mainland. Henry VIII recognised this threat and built the sister castles of Pendennis and St Mawes on opposite sides of the Carrick Roads to protect the anchorage. Thus began one of the most fascinating stories of British coastal defence spanning 450 years. 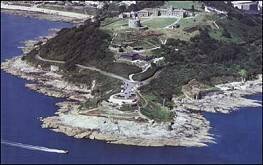 Pendennis Castle is a showpiece of British history and one of Falmouth's principal attractions. As the premier resort of West Cornwall, Falmouth's four main beaches of Gyllyngvase, Castle, Swanpool and Maenporth are second to none. Wide expanses of sand, dipping down to the seashore offer the perfect arena for sunbathing, swimming, sandcastle building or simply forgetting the rest of the world exists! Falmouth is a veritable waterworld. Climb aboard one of the many pleasure boats and ferries which ply the local waters to St Mawes, Flushing, Truro and the Helford Passage, and experience the maritime charm of this most beautiful part of Cornwall. For the more independent visitor, yachts can be chartered by the day from local businesses, which are happy to provide a skipper so that you can simply relax and enjoy the view. For those who like terra firma, a hop-on hop-off open top tour bus travels a continuous circular route in season linking the town, beaches and castle, or you can join a guided maritime walk led by our qualified Blue Badge Guides, just ask at the Tourist Information Centre for details. From the first custom built tourist hotel in 1865 to today's imposingly futuristic Ships and Castles Leisure Pool, the resort has invested in its future and is rapidly developing an international reputation as one of the great sailing and watersports centres of the world. Falmouth's International Maritime Centre opening to the public in 2002, will house the National Maritime Museum's small boat collection, Cornwall Maritime Museum, an events plaza and yachting centre. Falmouth has many fine restaurants. Click here to see our guide to help you decide where to eat. Falmouth's bustling town centre contains many of the expected highstreet names, alongside specialist craft shops, fresh seafood sellers, chandlers and vendors of all things nautical. Laced with many notable listed buildings such as the King's Pipe which was used to burn contraband tobacco in the days of smuggling, the town has a reassuring warmth and offers an exciting range of opportunities and watersports activities. In Victorian times, Falmouth's world wide links across the seas, led to the development of large private gardens, later donated to the local people, containing wonderfully exotic plants. Owing to the incredibly mild climate, species such as Citrus, Daturas, Dracaena Palms, Camellias, Abutilons, Azaleas, Rhododendrons and many unusual species of Bamboo still thrive today, and at Fox Rosehill Gardens banana trees grow in the open! In addition to Falmouth's four central public gardens of Kimberley Park, Gyllyngdune, Fox Rosehill and Queen Mary, winner of the Green Flag Park Award for both 1998 and 1999, the vast gardens of Trelissick, Glendurgan and Trebah are all within easy reach. For a more personal view of Falmouth and Cornwall, and to see Barry's photos, please check out Barry's Blog.